Click here to read more about settings within the Custom Calendar module as an administrator. 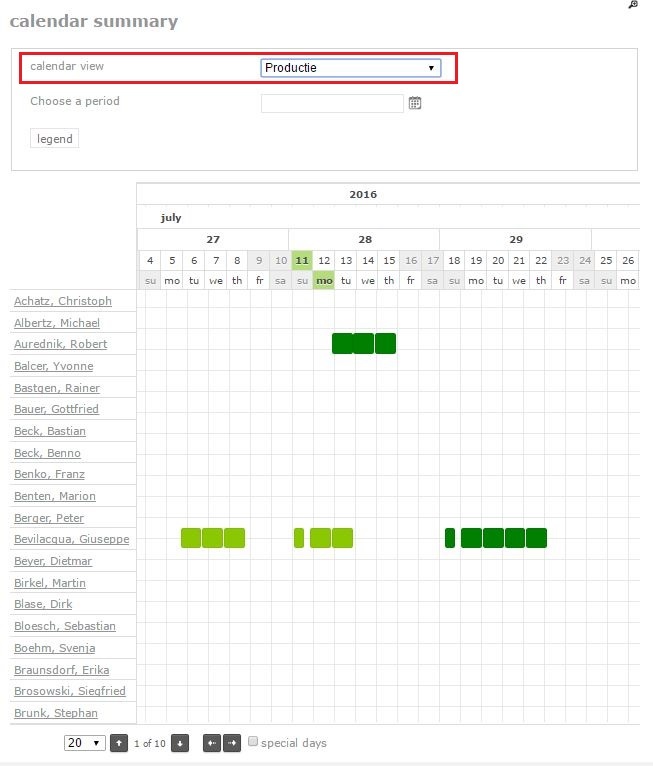 If a custom calendar was linked to you, as an employee, you will be able to view a customized arrangement of employees in your calendar summary. To get to the calendar summary, go to ‘Leave’ ⇒ ‘Calendar summary’. In the calendar summary, you can choose a calendar view in the dropdown bar (see image below). You have the option to just see your own calendar, if available the calendar of your department, and the calendar of the employees of whom you assess the requests, in case you are also a manager. As soon as the customized calendar summary has been linked to you, you will be able to select it in the dropdown bar. In this summary, you can view the calendar of a certain cluster of employees, as determined by the administrator. This can be very convenient when, for instance, you are working on a group project.